I am as fickle as fate. During the last couple of weeks I have been overwhelmed by a yearning for rain. Last weekend the garden had dried to a crisp, Hydrangeas were wilting and the Roscoea had curled their leaves to conserve the last scraps of moisture lingering in their veins. Suddenly the yearning was fulfilled, the rain came down sufficient to moisten the surface (it is still dry and inch or two down) and the appearance of the garden improved immediately. I stood at the front door watching it and I thought "this is jolly inconvenient, I had things to do". Just fickle. 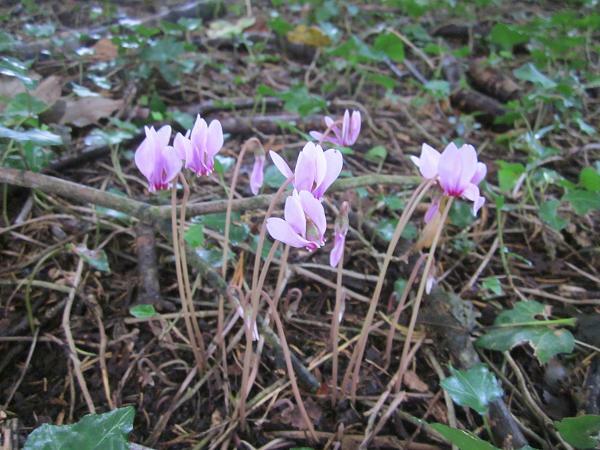 It doesn't take much rain to wake the Cyclamen. Last week there was no sign. I crawled around on my hands and knees under the trees looking for the first tiny buds and there were none. This week they are in flower. I'm not even sure the rain reached the groud where they grow, the trees deflect most of the water away from them, but they knew it had rained and up they came. I have visions of this whole area carpeted with the first flowery hint of autumn but they are increasing at the same rate as my wasteline (32 a decade ago and now 34). A bit more light and a nutritious mulch would help but I don't fancy thinning the branches above (too much precarious dangling) and I have even less enthusiasm for a day spent pushing barrowloads of manure up the hill. I will admire their tenacity and their slow increase with philosophical satisfaction (and idleness). The Roscoea have uncurled and continued to flower. They are appreciating the cooler, overcast weather that has followed the rain. Some of the species burst from the ground in full flower in the spring and then spend the summer in leafy recovery from the effort. 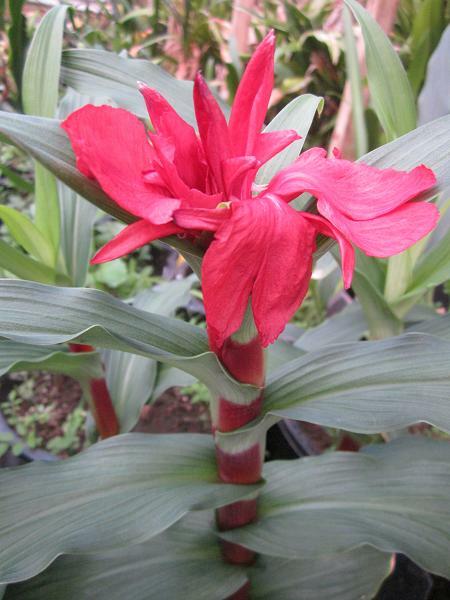 Roscoea purpurea comes up late, grows a sensible leafy stem and then flowers from the top of it. The scarlet blooms of 'Red Gurkha' are a surprise when they open among the purples and pinks of the rest of the genus. It is so distinctive that it is hardly surprising it was given a cultivar name. Unfortunately there are both red stemmed and green stemmed forms sheltering under the name (both from the original introduction) so there is a certain amount of ambiguity. 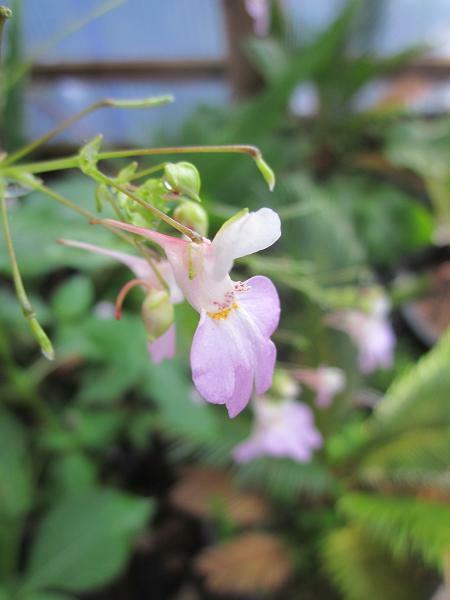 In her recent monograph on the genus Jill Cowly published the name R. purpurea f. rubra to cover them all, and time will tell if new cultivar names are published to distinguish the variations. Naturally I have tried to raise seedlings but without success. To begin with I thought that my clone might be self-incompatible so last year I pollinated it by hand with another clone. Still no success so this year I have one in a pot in the greenhouse where some additional warmth might improve its performance. Yesterday I was poking around with a pollinating stick (easier than a paintbrush) and was a little frustrated to discover that I didn't just need my glasses, I needed my good glasses. So this year I think I deserve some bloody seedlings! A small annual species from the north west Himalayas, the Flora of Pakistan suggests altitudes from 1500 - 3200m. I was sent it several years ago by Ray Morgan in a group of mixed seedlings and it flowered in the greenhouse for a few seasons and then disappeared. I assumed that the run of cold winters had finished it off. Suddenly this year a seedling grew on the floor of the Agave house. I don't know how the seed got there but I imagine it was carried up in one of the Cycas pots last year and has finally found the right conditions to germinate. I expect it has the potential to be a major pest among the Agave and would almost certainly colonise disturbed ground outside the greenhouse but it seems to like the warmth. The Agave house is poorly ventilated (deliberately) so temperatures soar during the summer. The original plants grew among the bulbs and cycads at the warm end of the greenhouse, and I haven't seen it in the Hedychium house, which is cooler and lightly shaded. It suggests that it might be a problem in the eastern counties but is unlikely to pose a threat here. It also suggests that the north western Himalaya is hotter and sunnier than I imagine and that the Hedychium would do better without the shade. Something to consider, though philosophical idleness may preclude action. I think of the flora of the Cape for the bulbs, both summer growing and winter growing. The former flower here in autumn and the earliest of the latter flower from late winter into early spring in the greenhouse. Despite that tidy reduction of the flora there remain a number of fascinating plants that do not fit the prescribed schedule. 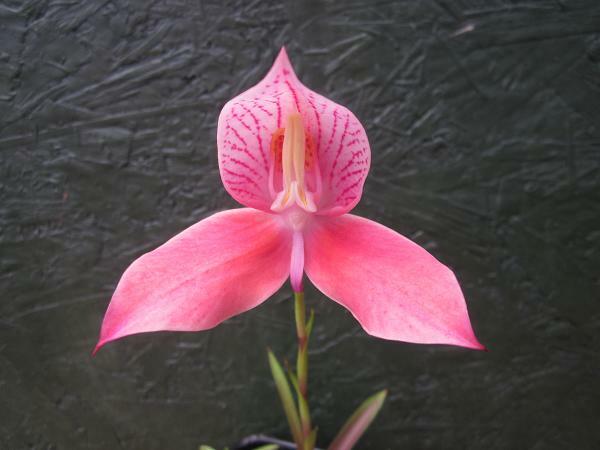 There seem to be Disa to flower at almost any time of the year, though there are few species that are also hardy enough to prosper in an unheated greenhouse this far north. D. uniflora is the brightest of them. The red form was one of the first Disa I grew and despite the abundance of hybrids based on it, I still retain an affection for the species. I have a handful of different clones, identified by number. They come into the 'red with a suggestion' range of colours and in most cases the suggestion is of orange. In this case there is a suggestion of pink, though it is faint enough to need reinforcing in the name. I have tried to grow the yellow form (three attempts, two failures so far) but it seems to be a bit feeble under my conditions. It has been suggested that it is less winter hardy than the typical form and less tolerant of dissolved salts in the water. Whatever the problem, I'm not going to build a new greenhouse specially to meet its peculiar needs. Certainly not. However, with my good glasses on I have self pollinated (Sunset x uniflora yellow) and now I am hoping for a few yellow plants among the seedlings - not that I'm counting chickens or anything on a pollination I performed yesterday! I think the rain has made me giddy.